I Was at Trump’s Inauguration. It Was Tiny. If it wasn’t for the thousands of protesters, the day would’ve had no life at all. On Friday, I spent roughly nine hours—from 6 am to 3 pm—on the streets of drizzling Washington, DC, inside and outside the Secret Service checkpoints at Donald Trump’s inauguration. 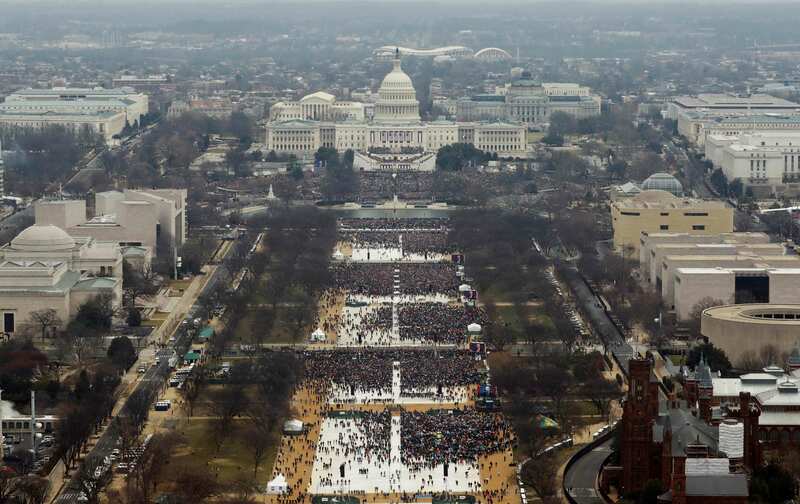 I have been to every inauguration since 1997, gauging the size and enthusiasm of the crowds. It’s fun and a perk of living in DC. So here’s the straight truth from someone who walked every inch of the inaugural ground on Friday. This was the smallest inauguration I’ve ever seen. I was tweeting that and saying it on camera to Democracy Now! during the day on Friday before I heard those observations justified by both aerial shots and Metro rider statistics. I said it because I saw the empty stands that were supposed to be filled with throngs of Trump supporters. I said it because I saw how easy it was to ride public transportation and drive into downtown. I said it because of the surprisingly sparse smatterings of red baseball caps as well as my conversations with local souvenir salespeople who were overloaded with “Make America Great Again” merchandise that wasn’t moving. It was obvious. The people just weren’t there. The fear of waning enthusiasm among the Trump faithful is real and well-founded. Not only does he enter office with the lowest approval ratings in the history of recorded numbers for an incoming president; not only does a significant majority dislike the way he has handled the transition; but his base supporters are looking at his appointment of billionaires, Goldman Sachs parasites, and DC swamp-dwellers and already wondering if they were sold a false bill of goods. I spent a good part of Friday looking for people in red #MAGA caps and speaking to them. I cannot say loudly enough how different their mood was from the 2001 and 2005 people with whom I spoke at the Bush/Cheney inaugurations. The Bush supporters were confident, ready to argue and even fight. The famously pugnacious Trump supporters were unsure, confused by the small turnout, and disoriented about how to respond to being on security-checkpoint lines and finding themselves outnumbered by chanting protesters. In addition, the Secret Service and TSA personnel in charge of the checkpoints, both groups maligned by this administration, were cracking jokes about the president-elect as we were going through the metal detectors. One TSA agent even took a button from me that said, “Solidarity Trumps Hate.” He wasn’t confiscating the button. He took it to wear (“later,” he told me). If it wasn’t for the thousands of protesters who came out for both permitted and non-permitted demonstrations, the day would’ve had no life at all. I know many are making jokes about Sean Spicer, Kellyanne Conway, and their embrace of “alternative facts.” On one level, you laugh to keep from losing your mind. But jokes alone are not going to cut it right now. It would’ve been so easy for Sean Spicer to say, “It was a rainy Friday. The crowds were small. Time to get to work making America great again.” The fact that they can’t admit something so small raises the terrifying prospect of what they will say when the question is not about crowd sizes but whether or not to go to war. The great journalist I.F. Stone once said, “All governments lie.” And that’s true. But I don’t think there’s ever been a group of people willing to set the bar so low. Unlike the Bush people, they’re not even bothering to construct false evidence for their lies. They’re just betting a majority of the country won’t care. We have to be better than that. We have to be better than them. The future depends upon it. Editor’s note: An earlier version of this article misattributed the quote “All governments lie” to Howard Zinn, who was in fact quoting I.F. Stone. The text has been corrected.